On the afternoon of Nov. 15 student leaders of the pro-democracy protests in Hong Kong were not allowed to board a flight to Beijing to attempt to meet with Premier Li Keqiang. Earlier that same day, perhaps anticipating they would not be allowed to make the trip to Beijing, the students published a letter to the premier inviting him to visit them in Hong Kong. The 3,000 word letter was posted at 3:35 a.m. on Nov. 15 to the Facebook page of the Hong Kong Federation of Students (HKFS), the student organization that has done the most to lead the Umbrella Movement in Hong Kong, although this grassroots protest has no official leaders. 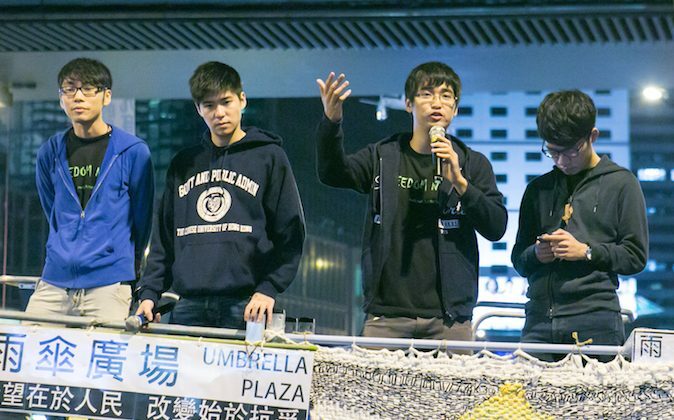 At 5:00 p.m. that afternoon three leading figures of HKFS, Alex Chow, Eason Chung, and Nathan Law, were scheduled to fly to Beijing, where they hoped to meet with top Party leaders. At the airport, though, the three students were told their re-entry documents had been withdrawn, and they were not allowed to board the airplane to Beijing. The letter HKFS published requests the withdrawal of the decision by the National People’s Congress on how Hong Kong’s chief executive should be elected (a decision that the students have characterized on other occasions as “fake democracy”) and the reopening of discussions with the students on political reform in Hong Kong. The students’ goal all along has been the election of the Hong Kong chief executive through universal suffrage. The letter also seeks to clear the name of the Umbrella Movement in Hong Kong from the charge of being manipulated by factions in the CCP or by “foreign forces”—a staple of the state-run media’s coverage of Hong Kong has been the claim that any protests there are due to hostile foreign forces. The letter also asks the prime minister to come see for himself what the situation in Hong Kong is. It argues that if he sees for himself how things are, he can make a judgment informed by the reality of Hong Kong, not by information passed to him by subordinates. The Hong Kong students have held for some time that the Beijing has been misled by reports from the Hong Kong government as to what the true situation is. That situation is one, the letter argues, in which the urgent social problems of Hong Kong can only be addressed by political reform. Below is a translation of an excerpt from the letter. In the untranslated parts of the letter, the students argue that all the actions fighting for universal suffrage including the Umbrella Movement (also known as Occupy Central) have been rational, peaceful, and selfless. The letter says the Hong Kong people started to fight for universal suffrage 30 years ago when it was a British colony, but the push for democracy stalled during the negotiations between Beijing and the British in the early 1980s. The letter also mentions how the Tiananmen Square massacre in 1989 disappointed the Hong Kong people. In May 1989, over a million Hong Kong people protested on streets to support the Beijing student movement, which opposed official corruption and asked for political reform. The bloody suppression on June 4 reduced the Hong Kong people’s confidence in Beijing, the letter says. Greetings. We are a group of college students in Hong Kong, writing this letter to you while sitting on a Hong Kong street. We sincerely invite you to come to Hong Kong, take a look at these Hong Kong people on the streets who haven’t gone home for months, and listen to everyone’s true feelings. Then, you will know what all this is for. If you can’t come, that doesn’t matter. We are glad to go to Beijing to meet you. As the Prime Minister, the highest official in charge of Hong Kong affairs, we hope you can listen to our hundreds of thousands Hong Kong people’s voices directly, instead of listening to all kinds of reports from “related departments.” Then, you can make a correct political judgment. The appeal of these hundreds of thousands Hong Kong people on the streets is very simple and direct: have the National People’s Congress (NPC) withdraw the decision over the Hong Kong elections made on Aug. 31 and resume the discussion of Hong Kong political reform. Second, the decision ignores the persistent demand for genuine universal suffrage by the majority of Hong Kong citizens and young students. Third, the decision undermines the confidence of the Hong Kong young people about whether the return of democracy to society would come true under the “one country, two systems” policy, and the decision shakes the foundation of healthy interactions between Hong Kong and mainland China. People with monthly income lower than $14,000 HKD [approximately US$1,805] are half of Hong Kong’s total population, and over a million people live below the poverty line. Based on their revenue structure, no matter how hard working they are, they can’t afford to buy a house, rent a shop, start a business, and give their children better education. The poverty passes down from generation to generation. For those of us in the younger generation, since we were born, we have deeply felt that Hong Kong is an unjust and desperate city. It has extreme inequality of opportunity, and a few elites dominate the political and economic lifeline. Why has Hong Kong come to such a situation? It’s because Hong Kong doesn’t have good governance, and doesn’t have a good blueprint for economic development and social reform. It’s unable to guarantee freedom of expression and independence of the judiciary, unable to establish a fair social and economic system, unable to reduce the disparity of wealth. Why is it hard to have good governance, development, and reform? Because Hong Kong is stuck in the bottleneck of political reform. Under an undemocratic system, political and business elites collude to manipulate society, the government ignores public opinion, the government doesn’t have the heart nor the ability to promote any just reform, and the public grievances get bigger and bigger. People of insight in Hong Kong, either the pro-establishment camp or the pan-democracy camp, have long been aware that without democratic reform, the political power crisis will be hard to solve, and it’ll be difficult for the government to govern effectively. In the past over 10 years, in order to achieve democratic self-government, Hong Kong people have appealed to implement people’s basic rights and with great care and perseverance have urged the government to heed good advice. It’s a pity that the Aug. 31 decision thoroughly disappointed us. We are taking another step forward today, even taking civil disobedience to occupy the streets. It reflects the past 30 years of history, and deep worry about Hong Kong. Dear Prime Minister, if you are at the scene, you will understand that we are definitely not presumptuous, nor are we instructed by others. We have to do this. We just hope that our most reasonable appeal could get the most basic respect. We really have no other way to have the Beijing government know the appeals and determination of our generation. Those in power must face the suffering, oppression, injustice, and resentment in this city. They can’t just deceive people by attributing it to “external forces.” Without facing the Hong Kong people’s persistent pursuit of democracy, facing the long term social conflicts and grievances, and getting into the context to think of a way to resolve these problems, Hong Kong will not be able to be governed. Those in power have already lost confidence from two Hong Kong generations. Would they still continue?